So obviously this blog has taken a dramatic turn since Felix’s diagnosis last month. I suspect I won’t be sharing healthy recipes or tips for natural living for quite some time, if ever again. The events of the last eight weeks have kind of rattled my entire life, and I have no idea where it’s going to go from here. In part, because I draw hope from the possibility that someone else going through similar things will get encouragement. Like I said in my last post, it’s important to find fellow sufferers and to not suffer alone. This is one way I’m reaching out. To keep family and friends updated. (Facebook alone doesn’t always cut it.) Since we’re currently living in the hospital two hours away from home, this is one way to stay connected to everyone back home. After thinking it over, I am planning to post quite frequently, though my posts will not be nearly as edited and polished as they used to be. I just don’t have the time to edit everything. I’ll share stuff as I write it. It will probably be clumsy and weird at times, with fewer pictures, and zero “pinnable” graphics. It might even be kind of blasphemous at times, and I’m sorry about that. But it will be honest and heartfelt. It’s TOTALLY OKAY if you don’t want to read it. I’m sorry that most of what I share will probably be rather depressing. I understand that my blog has become kind of a bummer. Back when my life was perfect (read: every day of my life until December 2, 2014), I could not and would not read stories of real-life heartbreak. I refused to read stories about children with cancer or other life-threatening illnesses, or from families that had experienced loss. I just couldn’t bear it. It was too much sadness. And they reminded me that my own life’s perfection could be threatened at any moment. I didn’t want to think about that. It made me sick to my stomach. In my blog roll, if anything too sad popped up, I would intentionally skip over it. Sorry, grieving family. I can’t deal with your sadness. But now that I’m living it, I can’t read anything else. I can hardly stand to read stuff from happy, healthy families. I struggle too much with the envy, and the feeling that they have no clue. I mostly just want to hear from other families going through similar turmoil. Because if they can make it through, maybe I can too. So if you’re in the happy camp, I don’t blame you one bit for skipping the sad posts I share here. Seriously. That was me eight short weeks ago. I totally get it. Don’t feel guilty or weird about it. And if you do still choose to read them: bless you. You are stronger and kinder than I ever was. My prayers for you and your family. I for one will keep reading with you and praying for you. I’ve followed your blog for awhile now and plan to keep it up – and try to say a prayer for you guys whenever I see a new post. As a mother of soon-to-be two little boys, I really can’t even fathom all of this but am thankful for the sustaining grace of Jesus that is evident in your story. I’m still reading, and praying. Miriam will actually ask every once in a while “So how’s baby Felix doing?” Do whatever you need to do, Kathleen – we’ll be here. Kathleen, I totally understand the pain and grief you are going through right now. We have a daughter diagnosed with cerebral palsy about 4 years ago. It was never part of my life plan to parent a child with special needs and I went through a period of grieving and I still grieve to some extent 4 years later and maybe always will. But I want to tell you that you can survive this, not on your own strength but with God’s help. Our experience has fundamentally change me in ways I can’t even describe and one of the biggest blessings is that I can relate to those who are in hard places. I wouldn’t give up that perspective now even though it was and still is a very painful part of my life. I would also say it’s ok to be angry and even to be angry at God. I had a friend ask me once if I had told God I was angry, let’s just say it never occurred to me that I could be angry at God and further that I could talk to Him about my anger. Give yourself time to deal with these feelings, they will come and go. Praying for you and I continue to enjoy your blog posts! I’m still with you and praying for your family! I have been reading your blog for a while now and am thankful for the many ideas and many more interesting thoughts I’ve gained from it. While it brings me to tears every time I read a new post, I won’t stop; it hurts to hear of someone’s pain, but it’s also an opportunity to pray, and so I do. I pray for you and your family and your beautiful little boy as well as my own family and thanking God for his omniscience. Thank you for being so willing to share your struggles to remind us of our blessings as well as our humanity. May He bring you more peace in every little way possible each day. I have been reading your blog since Advent a year ago; although I don’t believe I have ever left a comment. I will continue to read it, but I do not think i am any stronger or kinder than you ~just older. I have actually been more drawn to your blog, since you posted about Felix’s diagnosis. It is a total God thing, because i have not felt this way in response to many other blogs kept by others who were suffering. I truly appreciate your honesty. Thank you for allowing someone you have never even met to read along with your journey. I hope that through prayer i may be able to stand in the gap when you are too weary or overwhelmed. Please, do and say whatever you need to. I’ve never been challenged like this. But I am among those who will still be here, pulling for you. I’m glad you’ll be using this space, it’s your space and you should post as much or as little as you need to. We’ll be here. Do whatever is right for you and your family. I can’t even begin to imagine what you all are going through and I am in awe of your strength. I just wanted to tell you that I am here to support you. I first came to your blog a few weeks ago when I google searchered “How to wean your toddler.” You wrote about wanting to wean your daughter so you could get pregnant again. I womdered if you had been able to and went to the most recent posts. Only to discover your baby’s recent diagnosis. I just wanted to tell you that you are all in my prayers. Thank you for sharing your journey with all of us. I came for the No-Poo method. I stayed for the YOU. Your writing is a gift, and your sharing is authentic and as a result always valuable. Plus, now I just plain care about you and will want to know if and when there is anything I can provide. Big big hugs. you write what you need to. And you holler and scream at God. He’s got huge shoulders and feels every tear you cry. You don’t know me but please know I’ll be reading and crying for you all. And praying. I agree with Molly we will be here. I am glad you are going to keep writing. I’ve been around long enough to learn that life is sometimes just plain cruel and unfair. I’ve read most of your blogs mostly because I like your writing style and how brutally honest you are. I guess what I’m trying to say is, write what you want, say what you want, and do what you need to do to get through this trying time. I will keep reading and will continue to call down the healing hand of God on your behalf. I don’t read those sad blogs, either. But I’m still reading yours, because you’re my friend, even if it’s just a sporadic Internet blog friendship. Praying without ceasing for you all. I’m here, too. Maybe not with every single post, but I’m here. I don’t avoid your posts, but sometimes just don’t get to them…. or other blogs, but you remain in my prayers. I don’t mind your gut-wrenching honesty. Pour it out! I’m still following to. Perhaps a bit regularly now. Wanting to hear how you and your family are doing. Everything I look at my children, I breath a prayer for you and yours. You seem more like a friend than just a blogger I follow. St. Pail tells us, in regards to the body of Christ, to “weep with those who weep.” I am here to weep with you and to pray with you. I am here, reading, supporting, loving. Always. Your new post emails go into a gmail folder labeled “Project M,” and I get a little eager when I see that folder bolded. I love reading your updates and hearing your honesty and emotion. I’ve not needed to cope with anything remotely close to your situation, but staying close to your updates gives me hope that I *could* do it, *should* I ever need to do it. I hope that makes sense. Seasons change, life changes, blogs change. I won’t stop reading. This is your real life right now-it’s raw, vulnerable, and honest. Praying for your family. Praying for you all and will keep reading. Life is good and bad, but praying you get some of the good back again. Makes sense to me :) One story I can’t tear my soul away from is Kara Tippetts. (http://www.mundanefaithfulness.com/) That lady lives Jesus better than anyone I’ve ever known. And she’s completely authentically BEAUTIFUL in her struggles. She brings Glory here on earth, now. Anyways, just though you might enjoy the Light around her story right now. It’s messy, sad, and unbelievably full of Hope – the kind that does not disappoint. I agree with the previous comments that regardless of how why or when we found your blog, we want to be supportive and we aren’t going anywhere! I think it’s remarkable for you to even have this perspective…. that despite your sadness and anger now, for you to be able to look back on your thoughts later in life – very important and wise! Kudos to you. I’ve been praying for your situation and will continue to do so. Sending love from Maryland. I will still be reading, and praying. I am grateful that you have chosen to share your burden with us that we may continue to lift you up before the throne and pray for you specifically as the needs arise. I have enjoyed your blog since the Project M days and will keep reading. I’m heartbroken for you that so many doors have closed for you but hope and pray that you remain close to Christ as he leads you through these trials. You have been such an inspiration to me with the peaceful parenting blogs along with others and hope that this blog will go on to bless others who may be going through difficult (understatement) times. well, i’ll still be around! because, hey, i consider myself an original :) i cried so much the day i found about felix and couldn’t stop trying to imagine myself in your situation. plus, happy family blogs stress me out too much. because just like you said, it seems they have no clue. that’s totally judgmental, i know. i’m working on it, but i’m just too melancholic i guess. but, that said, i would love to see you return to happy blogging! i hope that’s obvious. I’ve been reading for around a year now. I have loved your blog. I don’t have children, but I so appreciate how you share your feelings and experiences about yours – as well as the rest of your life. I will pray for your family and for Felix, and want to say that I am so sorry for what you all are going through right now. I am so thankful that your husband is so supportive and that you have family you can entrust with the care of Lydia while you are away (though I know it breaks your heart to be away from her). I’ll keep reading! Even if it’s a little “blasphemous” at times :) God can take our honesty. Praying for you. Kathleen, my heart goes out to you. I’ve been reading your blog for some time now, and with particular interest since Felix’s diagnosis. I guess I’m motivated by the same tendency to gravitate toward fellow families going through tough times … I was pregnant around the same time as you with my first. 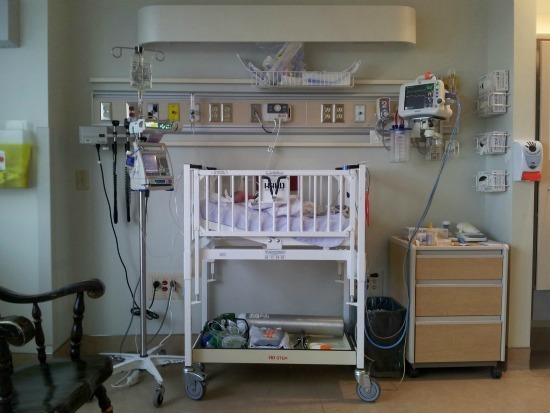 Baby J arrived in August — 9 weeks early, barely alive, and with many complications. We were stuck in the hospital away from family for two months, dealing with neonatal surgery and various health scares. We’re all home now but continue to grapple with physical and emotional hurdles. Every one of your posts since you’ve started writing about Felix’s illness has resonated deeply with me. I know what it’s like to spend your days waiting for news in a soul-killing environment, constantly having to push your biological and nurturing instincts aside. To watch your relationships and goals in life transform almost beyond recognition in an instant. And to be caught between fear and love for a tiny little person who seems so undeserving of such a rough start. We’ve been blogging our experience at lovethatkid.wordpress.com. It’s more carefully curated — less raw — than yours, at least for now, but you are welcome to follow along. And please don’t hesitate to reach out via blog comments or email if you’d ever like to chat. I’ll be thinking of you and your family.